MAF Releases Ai-luka 1, a New Industrial Cassava Variety! (Tetum) Friday 23 May saw the official release of Ai-luka 1, the latest Ministry of Agriculture and Fisheries (MAF) variety of cassava to be tried and tested in Timor-Leste. 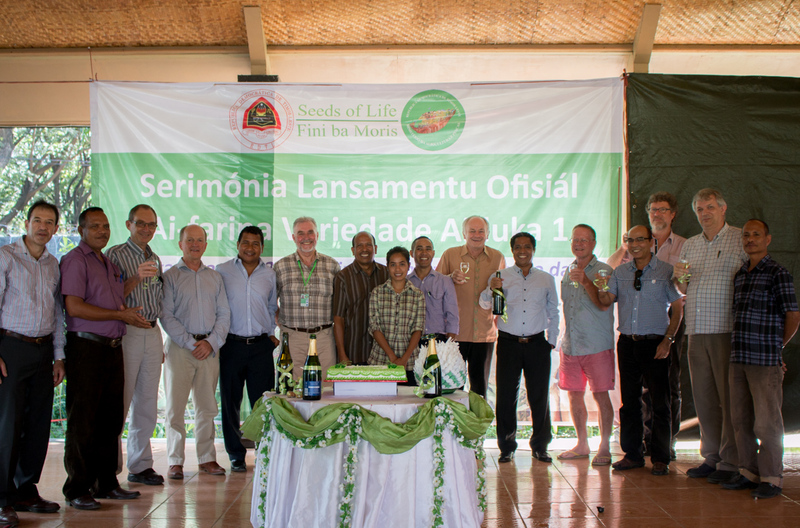 Officiating the release was the Vice Minister of Agriculture and Fisheries, Marcos da Cruz and MAF Director General Lourenço Fontes Borges, SoL Australian Team Leader John Dalton, SoL Australian Program Coordinator Harry Nesbitt as well as MAF-SoL researchers and staff. Eric Huttner and Peter Horne from Australian Centre for International Agriculture Research (ACIAR), the initial partner in the SoL program, were also present for the occasion. The day wasn’t complete, however, without special guest farmers from various districts who have been growing Ai-luka 1 in their fields for several cropping seasons, ever since Cooperativa Cafe Timor (CCT) began distributing Ai-Luka 1 cuttings in 2007. 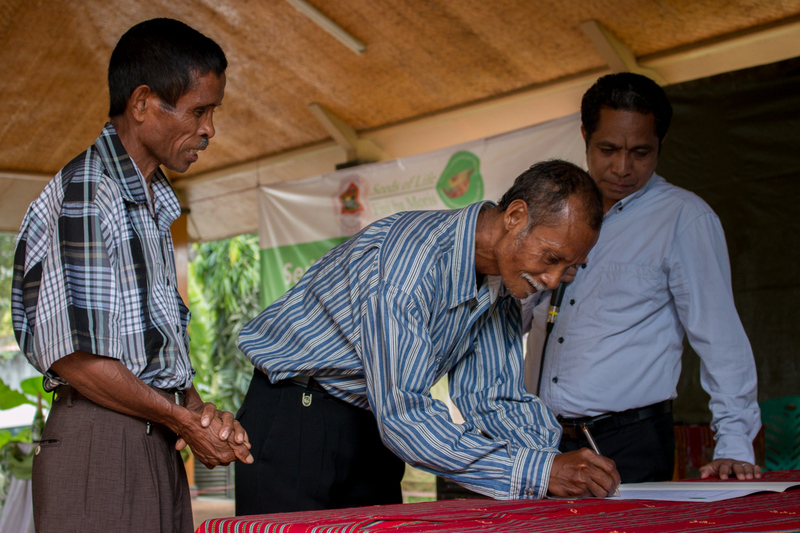 The vice minister watches on as a farmer signs the official release document, while another waits. Cassava is a standard crop in many regions of Timor-Leste with more than 85% of farming households cultivating it. Cassava grows on a range of soils and slopes, is mainly inter-cropped, grown in combination with other crops with a shorter growing season like maize, pumpkin, sweet potato and other vegetables. Cassava is relatively tolerant of poor soils and drought and is generally cultivated in the uplands. Ai-luka 1 is an “industrial”, bitter variety because it has elevated levels of starch and of hydrogen cyanide. The latter enables the tubers to be left longer in the ground with less risk of being eaten by pigs or rats, to be dried and sold as chips (e.g. to CCT for processing to cassava flour for export) or stored for a time as tubers or flour for later use as a food reserve. As Timorese farmers know well, drying and cooking bitter cassava activates a natural enzyme in the tuber that removes the bitter-tasting hydrogen cyanide and makes it safe to eat. The variety was tested in more than 16 combinations of locations and years representing a wide-range of situations. Ai-luka 1 joins Ai-Luka 2 and Ai-luka 4, the two “sweet” low cyanide and lower starch varieties that have been officially released previously, bringing the number of MAF released cassava varieties to three and the total number of released MAF varieties of food crops to 12.